WNW is a community space in the heart of L.E.S. brought to the NYC cycling world by DQM, Trackstar, Livestrong and Nike. It’s at Trackstar’s space (the flier had me confused for a second). Tonight is the opening party, from 7-9 at 231 Eldridge. WNW is a pop-up installation within Trackstar that works as a companion to the STAGES show. 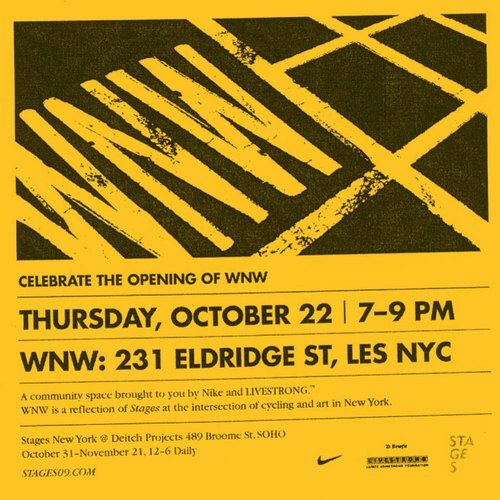 Open Weds – Saturday, 10/22-11/22, WNW is all dedicated to cycling and art in New York. It’s a place for the community to get a sense of what LIVESTRONG and the Lance Armstrong Foundation are about and to connect with people who are stoked on cycling and art. They will be serving free coffee and donuts every morning for riders headed to work, offering free flat fixes and teaching classes on bike stuff like wheel building and headset installation. There will be weekly rides visiting all five boroughs of the city that will leave from WNW. The London to Paris film will also be screened here. The Stages begins at Deitch on October 31st and runs through November 21st.